A meeting between the leaders of Poland and the US seemed successful enough until one picture created doubts about how well Warsaw was represented. Polish President Andrzej Duda's Tuesday visit to the White House was poised to be a win-win. Duda could have gone home to tell his people that the Americans are on his side; US President Donald Trump could have boasted once again of being tough on Russia. But a single photograph ruined the PR event. Duda and Trump agreed to boost their defense ties, and even relations in the realms of energy, trade and security. But a picture released by the White House showing the leaders signing the accompanying document has Trump glaring menacingly at the camera, bearing an "Apprentice"-style visage while sitting down, and Duda grinning delightedly as he hunches over to sign the document. "Nice on the part of President Trump to move a little, because otherwise our president would have to sign a document on his knees," Pawel Zuchowski, a Polish reporter, tweeted. ​Polish media and opposition politicians in the country are furious that their president was forced to stand while Trump sat. "It's incredibly ironic, because Duda, the Polish president, was proposing setting up a military base called Fort Trump, and then to have that kind of embarrassing thing take place is remarkable," Jeremy Kuzmarov, a professor of American history at the University of Tulsa and author of "The Russians Are Coming, Again: The First Cold War as Tragedy, the Second as Farce," told Radio Sputnik's Loud & Clear. Kuzmarov believes the controversy over the photo op, which was given considerable attention in the Washington Post, to be a temporary one. "There's a coalescence of interests as far as the United States and Poland that wants to stand up strong to Russia." Indeed, during the meeting, Duda praised Trump on a number of occasions. 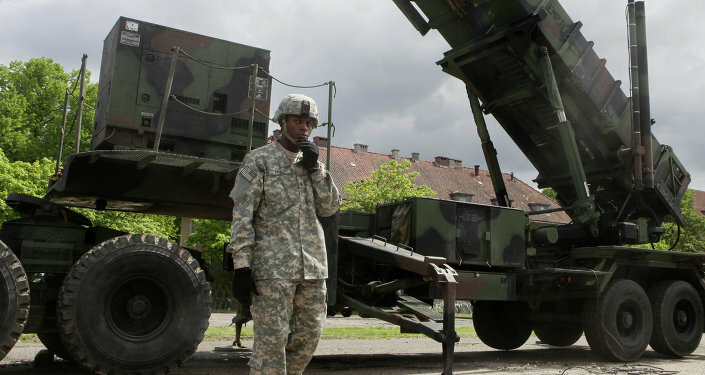 Warsaw has been trying to push Washington to set up a permanent military base on its soil in the name of fighting Russia for months. On Tuesday, Duda even floated naming it "Fort Trump." Some in the US military think such a move is ridiculous, Kuzmarov said. Lieutenant General Ben Hodges, commanding general of the US Army in Europe, argued in a June column that doing so would undermine NATO's cohesion, adding that many US allies would see it as unnecessarily provocative towards Russia. Still, Hodges conceded, "Eastern allies believe that the presence of US forces would significantly increase the deterrent effect, because they believe that Russia would never attack and risk a kinetic confrontation with US forces and the possibility of Russians killing Americans." If Russia ever attacked Poland, a NATO member, the United States and the other 27 members of the organization would respond with force: Article Five of the treaty states that all members must assist a member that is attacked. "I think we're seeing momentum in the United States for a stronger position towards Russia, and there are certain Polish interests in that as well," Kuzmarov told Loud & Clear hosts John Kiriakou and Walter Smolarek. Poland is still geared up to host Anakonda, a military exercise that will involve some 10,000 troops from 10 allied countries, some members of NATO and some not, in November. Meanwhile, the 5,000 American troops stationed in Poland already won't be going home over the picture.